For the most specialised of needs when temperature settings as low as -20C conditions do not suffice, PDQ Cold Call provides customers with a Dry Ice solution. We have a continual supply of Dry Ice in both small and large quantities and have developed a network of suppliers throughout the UK and Europe where additional Dry Ice can be obtained to either top-up levels for longer journeys or in case of an emergency. Our state of the art vehicles are equipped with the latest temperature monitoring technology. This means that we are able to remotely track the temperature of consignments. As an added benefit to customers, we ensure that all vehicles transporting Dry Ice consignments are run at a frozen temperature. This ensures the longevity of the Dry Ice and guarantees that your items reach their final destination in their optimal condition, without being compromised. Refrigeration units are fully maintained and serviced by the manufacturer at 16 week intervals and are covered by a European breakdown network. Furthermore, all vehicles are equipped with emergency standby cables and our high specification bodies ensure the interior temperature of the vehicle holds it temperature for over 2 hours, even during periods when the units are switched off. In addition to giving our customer peace of mind, it also satisfies our goal of reducing our carbon footprint and decreasing the environmental impact of our operations. A lot of time and thought goes into the various aspects of our courier logistics, allowing us to provide dry ice transport to clients in a way that meets all of their specific needs. Since our drivers have all received full safety and proficiency training, you can be sure that they’re well-equipped to carry out the correct regulations for transit that’s both safe and reliable. Our priority is to maintain the highest standards in every area of our dry ice courier services. We make use of the most up-to-date barcode technology to keep track of every item that’s being transported on behalf of our clients. Over the years, we’ve built up a trusted reputation by providing such a high level of service to every client that we’ve worked with. We’ve supplied dry ice transport to a number of multinational manufacturers and leading food retailers around the country. An indicator of the integrity of our services is shown in the fact that we hold full UKAS ISO 9001:2015 AND 14001:2015 accreditation. We’ll always practice the required guidelines and operating procedures, to ensure that our dry ice food transport service maintains a truly unparalleled level of excellence. You’ll be able to keep track of the exact location of your items using our online “track and trace” system, following the dry ice transportation down to the second. This way, you’ll know that your items arrived safely at their destination in the best possible condition. Many of our clients also made use of the portal to book future jobs after seeing the high quality and reliability offered by our dry ice courier services. 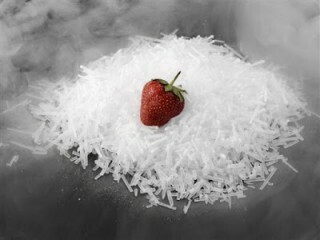 If you have any questions regarding our use of dry ice to transport food and other goods, don’t hesitate to get in touch. Our skilled customer service team can work with you to come up with bespoke delivery options, and they’ll happily provide you with some more information on our various courier options so that you’re able to make an informed choice when it comes to selecting the right package.